Apart from being beautiful, butterflies pollinate plants. 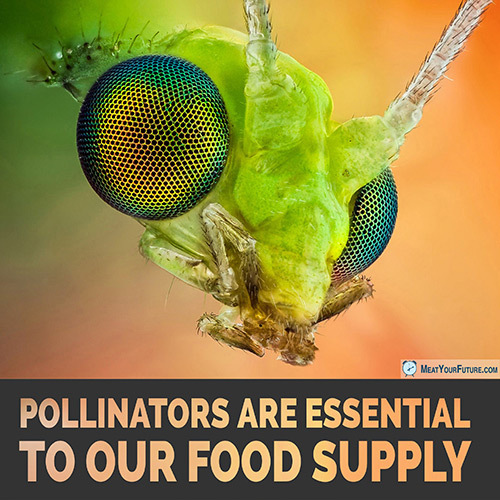 Pollinators — like bees, bats and butterflies — help pollinate 35% of the world’s food, a service worth billions of dollars each year (if not more). We are not as independent of the environment as we sometimes think! Unfortunately, the population of pollinators is declining, and many types are at risk for extinction. Along with pesticide use, habitat loss is one of the leading causes for their decline. Did you know that animal agriculture is the largest anthropogenic (man-made) user of land on the planet? It uses up more than 30% of the planet’s land surface and is the leading driver of deforestation and related loss of biodiversity. Please go vegan to withdraw your support for animal products — both to help protect and restore natural habitats, for the animals who are going extinct, and for the billions of other sentient animals who are exploited and slaughtered each year for foods and other products we do not need. Because animal agriculture is responsible for more greenhouse gas emissions that the entire transportation sector worldwide (in addition to its numerous other devastating environmental impacts), it will be unlikely (if not impossible) to timely and adequately address this problem without urgent action that includes a mass, global shift away from animal foods.